Is Globalization Good for the Poor? His recent blog post on the matter seeks to answer just that. Drawing on some of the latest research, he points out that “more globalization is indeed followed by decreasing poverty, but only a small part is explained by the growth of average income levels.” It seems that globalization via trade liberalization not only brings about income growth, but also increased information. In fact, lower trade restrictions and larger information flows seem to be the major factors behind decreasing poverty. Using various components from the International Country Risk Guide to quantify institutions such as government stability, law and order, bureaucratic quality, corruption and democratic accountability, in combination with the data from Bergh & Nilsson (2014), we showed in a follow-up paper (Bergh, Mirkina and Nilsson 2015) that the poverty-decreasing effect of globalization is bigger in countries where institutions are worse. 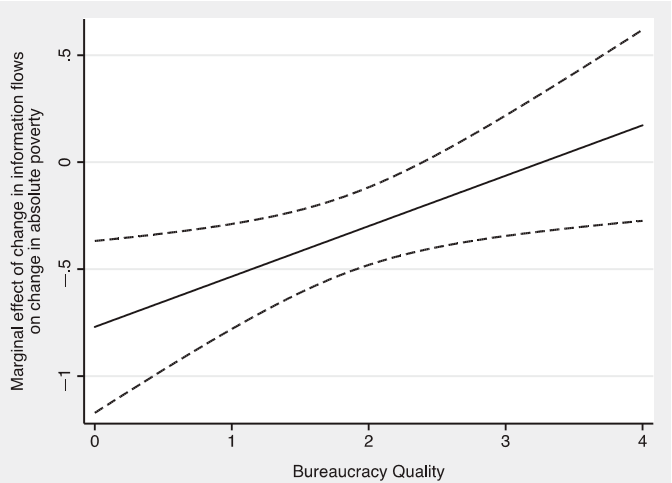 The graph below shows how the marginal effect of information flows on poverty varies depending on the level of bureaucratic quality. The slope looks the same for all institutional indicators, suggesting that globalization is especially important for the poor in countries with high corruption levels and inefficient public sectors.